Downtown Tacoma has been marked by downturns and rebirth. Once the most thriving area in the city, downtown Tacoma suffered a blow when many businesses decided to relocate to the Tacoma Mall, after its opening in the late '60s. Since then, downtown has made great strides in reestablishing itself as a hub of activity; offering an abundance of restaurants, bars, antique shops, cultural institutions and entertainment options. In addition to growing its cultural footprint, downtown Tacoma has been expanding its options for housing. Many vintage apartment buildings still dot the area, while condominiums have begun to spring up. Interspersed in the region are a wide cross-section of houses, ranging from fixer-uppers to the newly renovated homes. Read more about Downtown on our Blog! The installation of the University of Washington, Tacoma has been a major catalyst for growth in downtown Tacoma. With an enrollment of almost 5,000 students, UWT has helped stabilize downtown business and brighten the city's future. Diversity: 66% White, 14% Black, 8% Latino,8% Asian, 1% Native American, 1% Pacific Islander, 2% Other. Home to cafes, small shops, a yoga studio, and more, Opera Alley is a charmer just above Broadway. Even when it’s not exactly a shortcut, we like to stroll down Opera Alley when out and about around downtown. Located downtown in Tacoma’s Opera Alley, this is a Tacoma favorite for lunch, dinner, and a glass of wine. Stocklist is one of many revitalized storefronts along Pacific Avenue in downtown. Gift, stationary, PNW themed gear, and always a surprise or two. Opened in 2018, Honey is an extraordinarily welcome addition to the cafe and coffee scene downtown. Find it on 13th and Fawcett. This is an awesome downtown building repurposed to hold Lift Bridge Coffee, en Rama (cocktail lounge with awesome pasta), work spaces, a post office, and ballroom. On S. 9th Street in the Theatre District, go in here for cherry glazed donuts and other delights. This sidewalk garden made us wonder if we’d wandered into fairy woods. Head to Broadway between S. 9th and S. 7th if you want to get lost in a sea of antiques. If you’re catching the bus on Commerce, make time for a cup of tea. No longer an auditorium, but still a beautiful building on 13th and Fawcett. A view to the Port of Tacoma and the Old Clocktower from the balcony of The Union Club on Broadway. 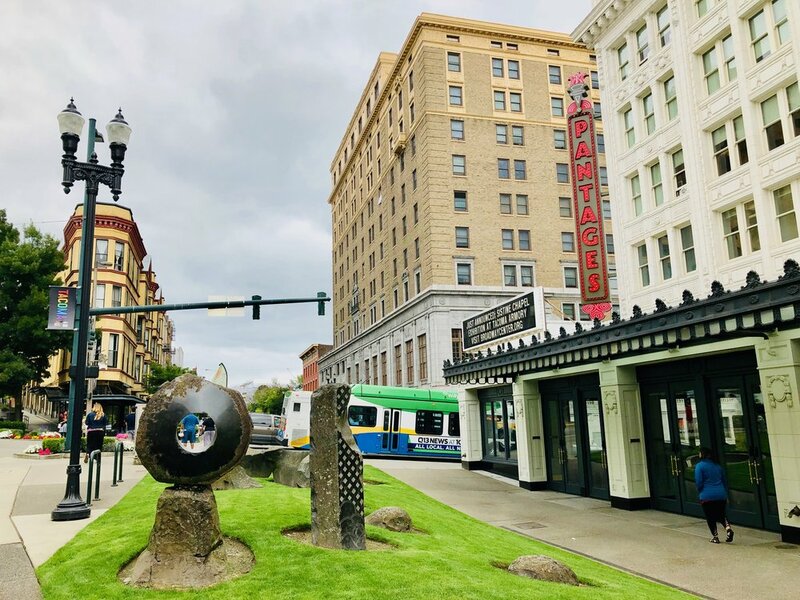 Home to the beloved Grand Cinema, Corina Bakery, and Tacoma City Ballet, as well as work spaces, this is a cornerstone of the city. Tacoma has seen the expansion of condos in the past several years. This one, near the Merlino Arts Center, shares some beauty with sidewalk landscaping. Just one of so many Tacoma breweries, Dystopian State sports a giant mural, and is a good spot to stop for a brew. Painted by Natalie Oswald and Nate Barber, this mural of cranes and cranes is a must see. On the corner of S. 7th and St. Helens Ave, find Supernova Barbershop and Puget Sound Pizza as well as The Mix. A pretty good intersection.